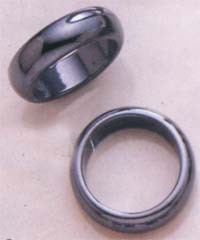 Discount Magic - Magnetic Ring (PK). This is the return of the original magnetic ring for magicians. These are great for simple routines such as "Chopless" Chop cup, and a great way to control, hold move, or grab light or magnetic items. Designed to have a modern look, they are purposefully not as strong as the Wizard PK Rings, and hence don't destroy your mobile, phone, and credit cards. There are 3 sizes available, 19mm diameter, 21mm, and now 22.5mm diameter. Each ring comes individually bagged.